The rewards of living in Atlanta include not having to choose so starkly between the excitement of the city and the restorative powers of the suburbs. In fact, the presence of both has been a factor here for so long that many of us might not notice it if we don’t take a closer look. The influence that this accessibility has on the value of Atlanta real estate is compelling. Atlanta condos have long been a mode of choice for young entrepreneurs and artists in Atlanta for their ability to put people in the center of all of the exciting things the city offers, and to add hours to the day by avoiding a commute. The balance of offerings among reclaimed and restored historic buildings and leading-edge Atlanta new construction makes city living even more attractive here. Metropolitan suburbs are making the line between city and suburb harder to see. In the process, a lifestyle that builds in the best of both worlds is growing in availability, just in time for a generation that places quality of life even higher than any that came before it. The people making the economy and its opportunities grow today are far less likely to compromise on their personal values. Those values include what might be called the simple pleasures of life – a walk with the dog after work, a place where neighbors encounter each other without planning it, a place where their children can play the way they once did and still flourish among the riches of culture that are found in one of the world’s great cities. 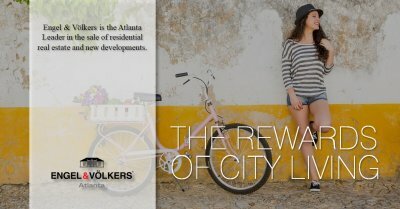 East Atlanta, Inman Park, and Alpharetta are just a few of the examples of places where Atlantans have found the feeling that comes from a town of their own, with its distinctive history and character, without trading off the big-city advantages of Atlanta’s business, education and cultural muscle. Alpharetta in particular has charted a course that preserves its hometown feel while accommodating imaginative approaches to living close to the pulse of the city. West Midtown has been a fertile ground for synthesizing city life with a walking, neighborhood feel. The Westside Provisions District demonstrates every day that “urban chic” can be unpretentious, down-to-earth, and still offer the essence of cutting-edge appeal. Even Midtown, the heart of commerce and finance for Atlanta, presents its own version of residential options with ongoing initiatives and a plan that makes living near work a pleasure, with walking, biking, streetscapes, and green space blended with the same care as the fine cuisine you’ll also find there. Engel & Völkers would be happy help you weigh these options. As the Atlanta leader in the sale of residential real estate and new developments, we stay up-to-the-minute on the value of trends like green cities and urban suburbs. Just call us at 404-845-7724 or find out more at evatlanta.com.